We are open for drop offs & pick-ups from 9am-12noon & 2pm-4.30pm every day except Xmas & New Year. please contact us by e-mail or telephone for an appointment. Viewing times 10am -12pm & 2pm -3.30pm. Closed to customers (although dogs are welcome to stay) from midday on Xmas Eve to 9am on 27th Dec and from midday New Year's Eve to 9am on 2nd Jan. Dogs are fed twice a day and we supply their bowls and feed We stock the following dog feeds: Chudleys Classic Dry Complete; Harringtons Dry Complete; Plain biscuit mixer; Tinned Butchers Tripe; Tinned Winalot; Tinned Chappie(a mix of meat and cereal). We aim to provide a diet that is balanced and as close as possible to what your dog eats at home (roast dinners excepted!). However, many owners decide to provide their own to avoid any diet change during a stay. If your dog is a fussy eater or has a sensitive tummy this is always wise. Please make sure that all feed is clearly labelled with dogs name and feeding instructions in a secure container. We have a fridge & freezer available for storage of fresh food. If your dog is on medication, please bring it in clearly labelled with dog's name and dosage instructions. Likewise, if your dog requires treatment we are happy to undertake basic procedures, such as eye bathing and topical creams, but please be aware that we are not a veterinary clinic and when we are busy more time consuming procedures are not always possible. Please call us to discuss prior to dropping your dog off. In exceptional circumstances special arrangements can be made at an additional cost. 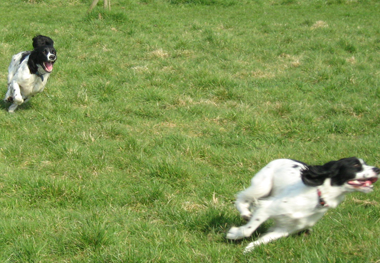 All dogs will be run off the lead in our big grassy field twice a day, in a group or individually depending on requirements. 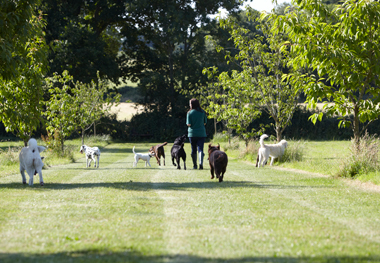 Both areas are securely ring fenced.Sociable dogs will get the opportunity to mix and play with others during the day, between walks. Plenty of space to have fun. Sociable groups are walked together off-lead. Please advise us about care required in as much detail as possible. With advance notice, we can reserve a nice quiet kennel where your dog can stay undisturbed by others. Sometimes it may be possible to team them up with others of a similar disposition. You are welcome to bring toys for dogs in the family pens, but those sharing a communal yard are not allowed toys - this is to avoid possible arguments over them! We would like to stress we are a ‘country kennels’ and inevitably from time to time dogs get muddy from running in the field. 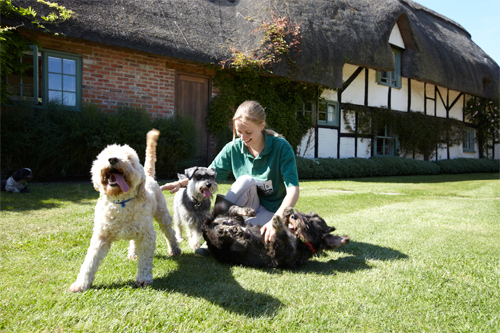 However, if you would like your dogs groomed before going home, we can arrange for them to be groomed by a professional groomer on site at the kennels in her mobile dogwash van on their last day of boarding. Please advise as early as possible. Charges are from £10 per dog.